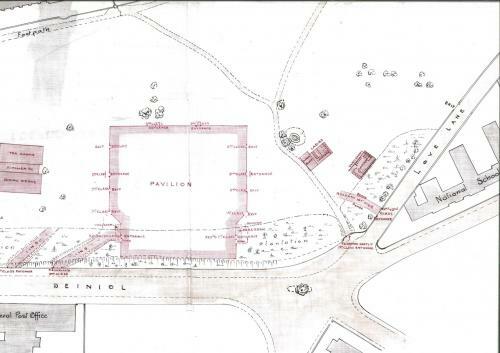 This is one of three plans of the ‘Proposed Site of the Eisteddfod Pavilion, 1914,’ held by the Archives and Special Collections (Bangor Ms. 13976). However, owing to the outbreak of the First World War, the National Eisteddfod was postponed from 1914 to 1915. On the 5th August, 1915, the Chairing of the Bard ceremony took place and the Chancellor of the Exchequer, the Rt. Hon. D. Lloyd George was present. Winner of the Chair was T.H. Parry Williams for his poem ‘Eryri’ (Snowdonia). In this year he also won the Eisteddfod Crown (an achievement he had already accomplished at the Wrexham National Eisteddfod in 1912).